Show your magic tricks to your friends with Harry Potter costume and his magic wand. If you are a real Harry Potter fan then show your love with an amazing wizard costume. Feel an excitement like a Hogwarts student and get your magic wand for new magic tricks. Boys got huge imaginations and creative minds. They look for same in their party costumes. Imagine your boys in the coolest ever costume and you will find same here. 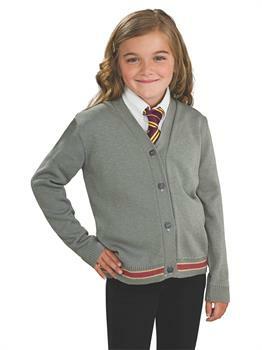 Make your special moments amazing in Harry Potter Hermione Cardigan and Tie Child costume and capture yourself in camera to make it forever. Care Instruction: Machine Wash Cold Water, Delicate Cycle. No Bleach. Line Dry, Cool Iron if Necessary.